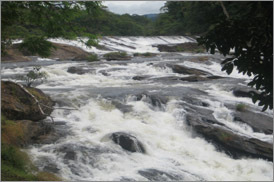 Athirappilly water falls,Guruvayoor pilgrimage,Honeymoon kerala,Kerala honeymoon ,Kerala weekend tour,Kerala weekend hokidays,Kerala Tourism,Kerala Tour Packages,Pilgrimage Tours of India. 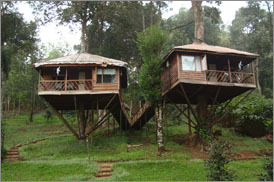 Tree houses are wooden houses built on top the trees. 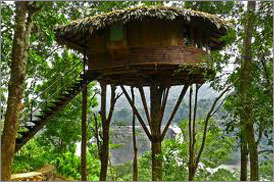 Tree houses have been constructed using eco friendly materials without even using a single nail using materials like coir mats, bamboo poles, hay straws, live trees. 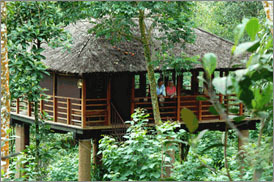 Tree houses are originally used by the tribal’s and hunters to escape from the attacks of wild animals. Day 01 -----Pickup from the Airport \ Railway Station. Transfer to Athirappilly. Sightseeing on the way: Kodanad elephant training centre. Enjoy Elephant ride and watch baby elephants. Continue the journey to Athirappilly .Sightseeing on the way Athirappilly Falls, Charpa falls &Vazhachal falls Check-in at Tree house .Over night at Tree house. 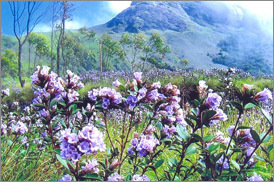 Day 02----After breakfast Transfer to Munnar. Sightseeing on the way- Neriyamangalam Bridge, Lush Forests, Rubber Plantations, Cheeyappara, Valara, and Kallar Water Falls. Enjoy the camp-fire and relax .Over night at Tree house. Day 04----After breakfast transfer to Thekkady. 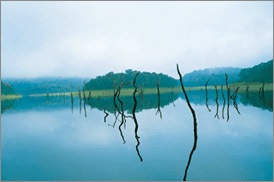 Enjoy boating in Periyar Wild Life Sanctuary. Spice Plantation Visit, Tea Factory Visit, Elephant safari, Kathakali Drama Performance at night. Over night at Tree house. Day 05----After breakfast visit Parunthumpara- a hill point blessed with natural beauty at its peak, Gavi- Gavi is an eco-tourist spot. Enjoy trekking, Boat ride & Museum visit. Return to Thekkady hotel & Relax. Day 07----After breakfast return to Kochi sightseeing around Kochi.Marine drive boating/Fork Kochi. Transfer to railway station or bus stand or Airport. Tour Ends, but not the sweet memories.